Mushroom and green peas are a cute pair, they complement each other well and they taste so good. This curry is more of a stir-fry but a slow one, the juicy, lightly caramelized mushrooms and the fresh green peas on a simple onion-tomato base hit it off with just a dash of black pepper and red chilli powder. This is a simple and elegant dish. If you’d like the stir fry to be drier, skip the tomato. I didn’t add any water to this curry as I wanted a dry curry. So keep an eye on this curry while it cooks so that it doesn’t burn. Browning the mushrooms separately is the key to getting a dry curry not to mention the oodles of flavour that it adds to the dish. Serve hot with roti or rice. 1. Rinse mushrooms well in water. Drain and pat dry. 2. In a pan, heat 1 tbsp oil and add the rinsed mushrooms. Fry till all the water has evaporated and the mushrooms start browning around the edges. Remove on to a plate. 3. In the same pan add the remaining oil and add the chopped onions. Stir around till the onions turn translucent. Then add the ginger garlic paste and let fry for 2 minutes. Then add the chopped tomatoes and sauté till soft. Then throw in the green peas. Season with salt, red chilli powder and turmeric powder. Mix well. Cover and simmer for 10-12 minutes till the green peas are cooked through. Then add the fried mushrooms and mix well. Add black pepper powder. Mix well. Simmer for another 3-4 minutes for everything to blend together. 4. Serve hot with rice or roti. 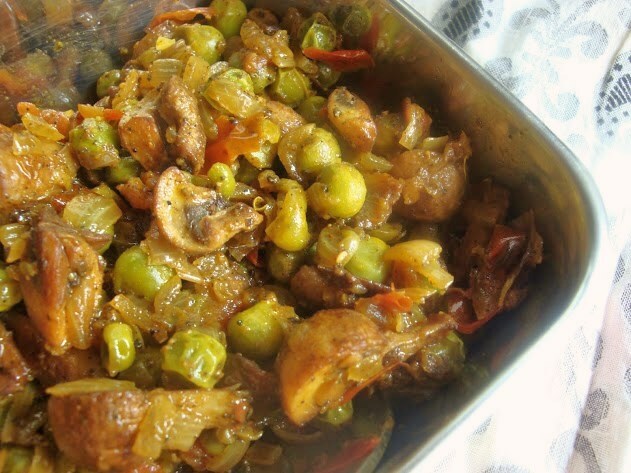 This entry was posted in Sides/Vegetables and tagged curry, mushroom, mushroom & green peas curry, peas, recipe, side dish, side dish with roti.